The holiday hiring spree has begun. According to today’s jobs report from the federal Bureau of Labor Statistics, the nation’s retailers added 434,500 people to their payrolls in November. 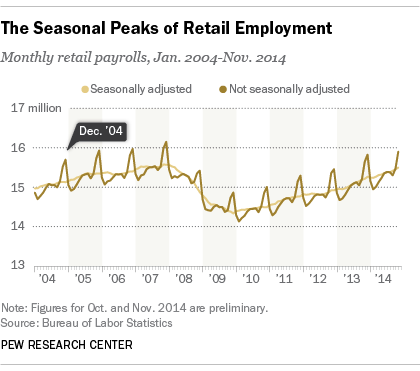 If history is any guide, retail payrolls will rise again this month before dropping sharply after the New Year. Much of that increase, however, is concentrated in a handful of retail sectors. Last year, for example, nearly a third of the retail employment surge (202,400 jobs) occurred at clothing and accessories stores, and more than a quarter (177,400 jobs) at department stores. The pattern appeared to continue last month: Clothiers and department stores accounted for more than half of November’s retail job gains, adding 121,600 and 114,700 jobs respectively. Other good places to seek holiday employment were general merchandise stores (78,600 jobs added between October and December 2013, about 13% of the total increase) and sporting goods, hobby, book and music retailers (65,800 jobs, or 11% of last season’s total increase). Those patterns haven’t changed much over the past decade, though department stores account for less of the seasonal surge than they used to (as well as a smaller share of retail employment generally) and clothing/accessories stores account for more. Most retail sectors participate in the pre-holiday hiring surge, though some more so than others. Grocery stores and drugstores, for example, have little or no wintertime seasonality; building-material and garden-supply stores hit their peak payrolls in summer, coinciding with construction season. While the pre-holiday hiring surge is impressive, the post-holiday drop is even more dramatic. 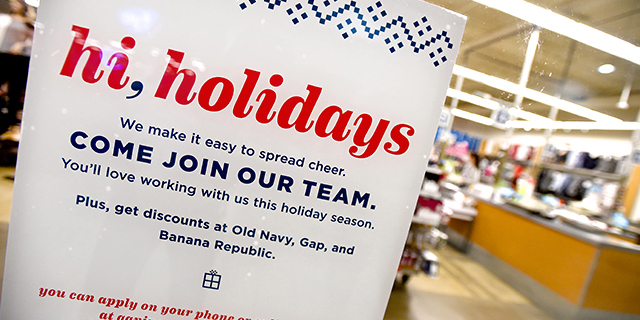 Retail payrolls typically fall 5% to 6% between December and February, as retailers with disappointing holiday sales lay off staff and close unprofitable stores. 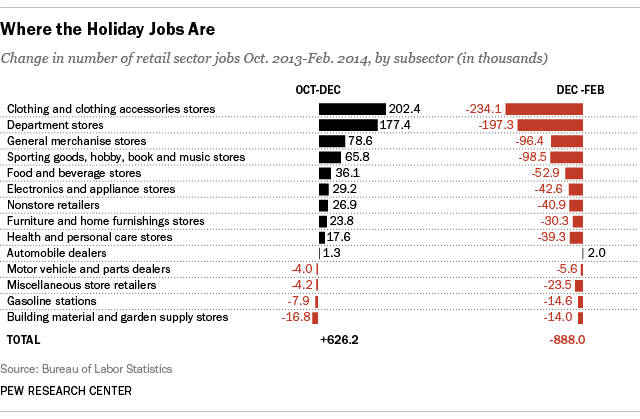 (This past year, retailers shed a combined 880,000 jobs in the two months after Christmas.) For some struggling retailers, a bad holiday season can be the final push over the ledge: Circuit City announced in January 2009 it was closing down; Borders filed for bankruptcy in February 2011.